German Finance Minister Wolfgang Schaeuble said yesterday Greece's new hard-left government needs "a bit of time" but is committed to implementing necessary reforms to resolve its debt crisis. "The new Greek government has strong public support," Schaeuble said in an interview with German newspaper Bild am Sonntag. "I am confident that it will put in place the necessary measures, set up a more efficient tax system and in the end honor its commitments. "You have to give a little bit of time to a newly elected government," he told the Sunday paper. "To govern is to face reality." Schaeuble also insisted that his Greek counterpart Yanis Varoufakis, despite their policy differences, had "behaved most properly with me" and had "the right to as much respect as everyone else." 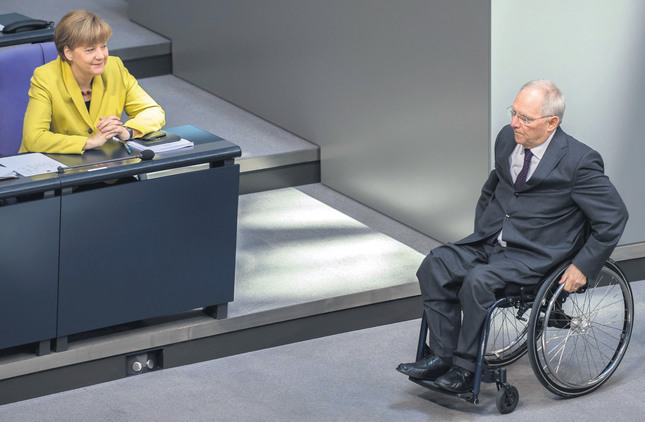 It was a marked change in tone for the strait-laced Schaeuble, who has repeatedly exchanged barbs with Varoufakis, his virtual opposite in both style and politics, since January's watershed Greek elections brought in an anti-austerity government. Schaeuble last week sternly warned that Greece would not receive "a single euro" until it meets the pledges of its existing 240 billion euro ($270 billion) bailout program. But he put his weight behind a four-month extension, to the end of June, approved overwhelmingly by the German parliament on Friday after a complex compromise reached between eurozone finance ministers and Athens. In exchange, Greece has pledged to implement reforms and savings.